The common problem that exists in all men is that they understand the truth but cannot put it into practice. One factor is that man is unwilling to pay the price, and the other is that man’s discernment is too inadequate; he is unable to see past many of the difficulties that exist in real life and knows not how to appropriately practice. As man has too little experience, poor caliber, and limited understanding of the truth, he is unable to resolve the difficulties he encounters in life. He can only pay lip service to his faith in God, yet is unable to bring God into his everyday life. In other words, God is God, and life is life, as if man has no relationship with God in his life. That is what all men believe. Such manner of faith in God will not allow man to be gained and perfected by Him in reality. In truth, it is not that the word of God is incomplete, but rather that the ability of man to receive His word is simply inadequate. It can be said that almost no man acts according to God’s intentions. Rather, their faith in God is in accordance with their own intentions, established religious notions, and customs. Few are those who undergo a transformation following the acceptance of God’s word and begin to act in accordance with His will. Rather, they persist in their mistaken beliefs. When man begins to believe in God, he does so based on the conventional rules of religion, and lives and interacts with others entirely on the basis of his own philosophy of life. Such is the case for nine out of every ten people. Very few are those who formulate another plan and turn over a new leaf after beginning to believe in God. None regard or put into practice the word of God as the truth. Take faith in Jesus, for instance. Whether a man was a novice in the faith or had been of the faith for a very long time, all simply put to use whatever “talents” they had and demonstrated whatever “skills” they possessed. Men simply added “faith in God,” these three words, into their usual lives, yet made no changes to their disposition, and their faith in God grew not in the slightest. The pursuit of man was neither hot nor cold. He said not that he did not believe, yet neither did he give fully to God. He had never truly loved God or obeyed God. His faith in God was both genuine and feigned, and he turned a blind eye and was not earnest in practice of his faith. He continued in such a state of befuddlement from the very beginning until his time of death. What is the meaning in this? Today, you must set on the right track since you believe in the practical God. Having faith in God, you should not solely seek blessings, but seek to love God and know God. Through His enlightenment and your own pursuit, you can eat and drink His word, develop a true understanding of God, and have a true love of God that comes from your heart. In other words, your love for God is most genuine, such that none can destroy or stand in the way of your love for Him. Then you are on the right track of faith in God. It proves that you belong to God, for your heart has been taken possession of by God and you can then be possessed by nothing else. Owing to your experience, the price you paid, and the work of God, you are able to develop an unbidden love for God. Then you are freed from the influence of Satan and live in the light of God’s word. Only when you have broken free from the influence of darkness can you be deemed to have gained God. In your belief of God, you must seek this goal. This is the duty of each of you. None should be complacent with things as they are. You cannot be of two minds toward the work of God or regard it lightly. You should think of God in all respects and at all times, and do all things for His sake. And when you speak or do things, you should place the interests of the house of God first. Only this conforms to God’s will. The greatest fault of man having faith in God is that his faith is in words only, and God exists not at all in his practical life. All men, indeed, believe in the existence of God, yet God is not a part of their everyday lives. Many prayers to God come from the mouth of man, but God has little place in his heart, and so God tries man again and again. As man is impure, God has no alternative but to try man, so that he may feel ashamed and come to know himself in the trials. Otherwise, man shall all become the children of the archangel, and become increasingly corrupt. During man’s belief in God, many personal motives and objectives are cast off as he is unceasingly cleansed by God. Otherwise, no man can be used by God, and God has no way of doing in man the work that He ought. God first cleanses man. In this process, man may come to know himself and God may change man. Only after this can God work His life into man, and only in this way can the heart of man be fully turned to God. So, believing in God is not so simple as man may say. As God sees it, if you only have knowledge but do not have His word as life; if you are limited only to your own knowledge but cannot practice the truth or live out the word of God, then this is proof still that you have no heart of love for God, and shows that your heart belongs not to God. Coming to know God by believing in Him; this is the final goal and that which man shall seek. You must devote effort to living out the words of God so that they may be realized in your practice. If you have only doctrinal knowledge, then your faith in God will come to naught. Only if you then also practice and live out His word can your faith be considered complete and in accord with God’s will. On this road, many men can speak of much knowledge, but at their time of death, their eyes brim with tears, and they hate themselves for having wasted a lifetime and lived for naught to old age. They just understand doctrines but cannot put the truth into practice and bear witness to God, instead just running hither and thither, busy as a bee; once they are on the brink of death they finally see that they lack true testimony, that they do not know God at all. Is this then not too late? Why do you not seize the day and seek the truth that you love? Why wait until tomorrow? If in life you do not suffer for the truth or seek to gain it, could it be that you wish to feel regret in your dying hour? If so, then why believe in God? In truth, there are many matters in which man, if he devotes just the slightest effort, can put the truth into practice and thereby satisfy God. The heart of man is constantly possessed by demons and so he cannot act for the sake of God. Rather, he constantly journeys to and fro for the flesh, and profits nothing in the end. It is for these reasons that man has constant troubles and afflictions. Are these not the torments of Satan? Is this not corruption of the flesh? You should not fool God by only paying lip service. Rather, you must take tangible action. Do not fool yourself; what is the meaning in that? What can you gain by living for the sake of your flesh and toiling for fame and fortune? Previous：Is the Work of God So Simple as Man Imagines? 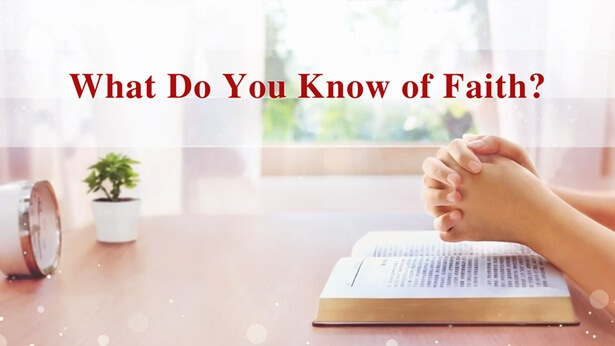 It is Heaven’s law and earth’s principle to believe in God and know God, and today—during an age when God incarnate personally does His work—is a particularly good time to know God.